This resource is a DIGITAL GAME to be played on a DIGITAL DEVICE. 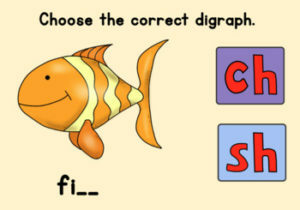 It will help children to review digraphs ch and sh. This game can be played on interactive whiteboards, computers, and tablets. An INTERNET CONNECTION is REQUIRED. This set of digital task cards has 14 different images with words. Each word has missing letters. Students decide if the missing letters on each card are the digraph ch or sh. They click on the correct digraph. This activity, which includes 14 cards, can be played over and over again and the cards will be shuffled each time! This resource is digital, interactive, paperless, no prep, and self-checking. Each card indicates whether the answer is correct or not. The game is fun and easy to use. Please note that this activity is HOSTED on the BOOM Learning Site and NOT on TpT. When you download this digital resource, you will be provided with a pdf which takes you to the full version of the game on BOOM Learning! Boom Cards play on modern browsers (released in the last three years) on interactive whiteboards, computers, and tablets. Boom Cards apps are also available. Not sure your browser is modern enough? Try a free Boom Cards deck first. When you redeem your purchase, Boom Learning opens an account for you if you do not already have one. For TpT customers new to Boom Cards, Boom Learning will give you, for one year, a free account that lets you track student progress for up to 80 students. At the end of that year, you may renew or choose not to renew. If you do not renew, you will be able to continue using Boom Cards with the Fast Play feature. Fast Play does not track individual progress. To view more of my Digital Resources, click the link below. To view more of my ELA Resources, please click on the link below.